2016 was certainly one for the books. The Surfrider Foundation had a record-breaking year with over 60 victories – and 19 of those were in California! If ever doubt existed about the power of grassroots activism, the amount of progress we’ve made this year should surely lay that to rest. None of these victories would have happened without the dedication of our network of activists. Surfrider staff and chapter volunteers attended countless hearings and testified at the California Coastal Commission and other state and local agencies resulting in a number of policy wins. Influencing state-level governance is a vital part of our work protecting California’s coast and improving coastal access. Read on for an account of our policy progress and victories in California in 2016. 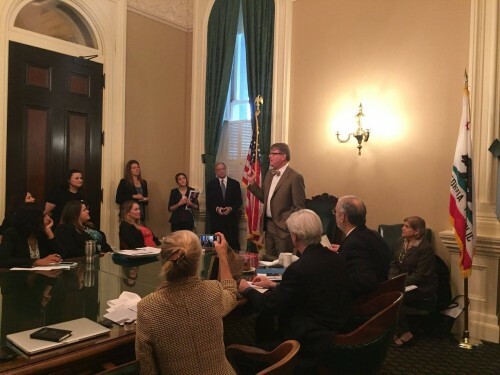 Each year, Surfrider helps coordinate dozens of ocean, coastal and social justice advocates descending upon the Capitol to educate our legislators and their staff about issues confronting California’s coast. In 2016, the agenda was quite extensive and several topics led to victories or great progress later in the year. You can find out more about the topics covered, here. After six years, hundreds of thousands of dollars in legal fees and staff time, and countless hours from our South Orange County chapter, the illegal gate imposed at Strands will be locked – in the open position! More at the OC Register. In September, Governor Jerry Brown signed Surfrider-supported AB 2616 into law. The bill directs the California Coastal Commission to consider environmental justice when making decisions. This is a victory for those typically underrepresented on coastal environmental issues and for public access as a whole. In November, Surfrider advocated to the Coastal Commission to require the inclusion of women in the big wave surfing event, Titans of Mavericks. Commissioners listened and required a women’s heat in the 2016/2017 event permit, as well as a plan for further integration in subsequent years. Read all about it, here. In December, we secured a huge and much anticipated win for access in Malibu Beach. 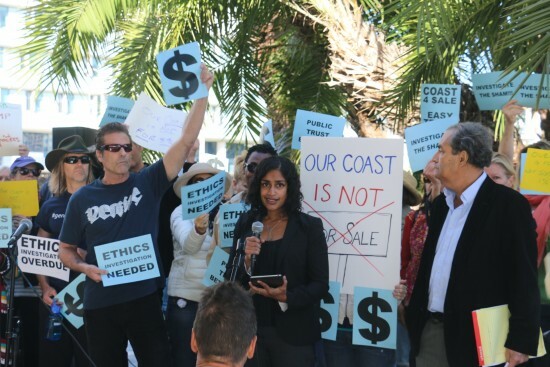 Surfrider staff and advocates asked the Coastal Commission to increase the fine of an egregious access violation to send a clear message that this is a serious issue. This was of particular note as the Commission had not yet exercised its power to levy civil penalties. We won and the gate blocking public access was ordered to be removed – and a portion of the $4.1 million fine will go to building a path and stairway for the public! Full details, here. It was a long and hard-fought battle, but finally, Trestles is saved - FOREVER! California voters rejected Big Plastic and upheld the statewide plastic bag ban. Read all about our #Yeson67 campaign here. Long term surf monitoring was incorporated into the San Elijo Lagoon restoration project on par with the monitoring required for other important biological and ecological resources – a precedent setting acknowledgement of the importance of recreational resources. Here are the full details. Along with the San Diego County Chapter, we won several San Diego County sea wall and development fights at the Coastal Commission at the January, June and July hearings. Find out more about these on the ActCoastal coalition vote chart reports, here. We’re also making headway on a variety of important issues! The Coastal Commission is hiring a new Executive Director, which could have a significant impact on the direction of the Commission. In March, Commissioners approved our request to amend the position description to highlight the importance of staff independence. We’re now encouraging everyone to participate in this search process to ensure strong and transparent protection of California’s Coastal Act. Click here for a link to the survey and suggested responses. Years of work to reopen Martin’s Beach is moving ahead, albeit somewhat slowly. Our work advocating to the State Lands Commission has led to significant progress. We hope to call this a victory in 2017! We’ve been tracking the many desalination plant proposals statewide very closely, namely, Poseidon’s Huntington Beach proposal. We recently voiced our concerns about the project to the State Lands Commission, the lead environmental review agency, and expect to call this 15-year-plus battle a victory next year as well. We're also on a mission to reverse coastal erosion in Monterey Bay by stopping illegal sand mining operations. 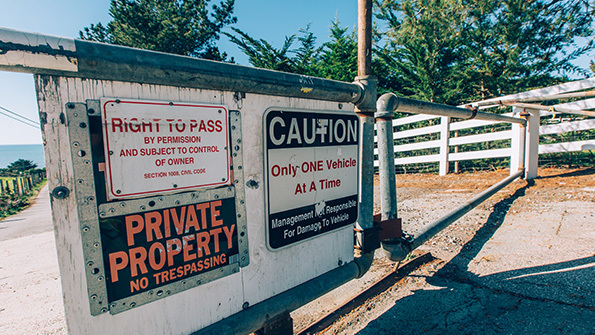 We've alerted State Lands Commission to the issue and are working hard to stop Cemex's operations in Monterey Bay. Read more about our #StopCemex campaign, here. We're ready for another year of record-breaking victories in 2017. The political arena has changed at the federal level and will require even more effort, commitment and support. Rest assured, Surfrider will not waver in our mission to protect 100 percent of our country’s coast! We plan to build on all of the local and state-level policy progress we’ve already made in the coming years – but we can’t do it without you! There has never been a better time to get involved with Surfrider. Join us! Volunteer with your local Chapter, become a member and donate. Together, we can save and protect California’s golden coast.